Ever had a puppy that somehow got away from the leash? You know how every time you approached it to try to reattach the leash, it thought you were playing a game of “chase” and ran away? Well, the bond market is the puppy and the Fed is the frustrated pet owner. The poor Fed has been running around its lawn, dressed in nothing more than pajamas for almost two years in a futile effort to corral an errant (but cute) bond market. Their next meeting is scheduled for March 18, less than a month away, and frankly this is getting ridiculous. They should just bite the bullet and do something to get in front of the bond market. This clumsy chase is undignified for such a hallowed committee of out of shape economists. Bernanke is in a tough spot: control inflation or stoke growth to prevent a recession? He’s clearly ignoring inflation right now (and the emaciated dollar) for a full onslaught against the deepening recession. The only thing Bernanke can offer to mollify those pulling their hair out at the sight of inflation is that he’s keeping a lazy eye on it. The man is after my (financial) heart. I just wish he’d moved sooner and cut deeper. I love your website and love our commentary. You have helped me with my trading. Having said that I do want to say that right now I disagree completely with you on the market direction. Right now one of us has got to be wrong. Look at the chart of FXE, GLD and your recent chart of the S&P 500 or a weekly chart of the SPY. Price triumphs over all else and the SPY has made a very large weekly head and shoulders with it barely making it back to the neckline. I love technical analysis and base all of my trades on it but I do not ignore the fundamentals. The fundamentals are getting worse in a sea change sort of way in the good old USA. The SPY is now at about 138. It has to break 144 decisively to make my position invalid. Who knows? It may. But until it does the head and shoulders neck is too much resistance. Keep up your great posts though. Being Right or Wrong is not important. Trading well is important. Thanks. 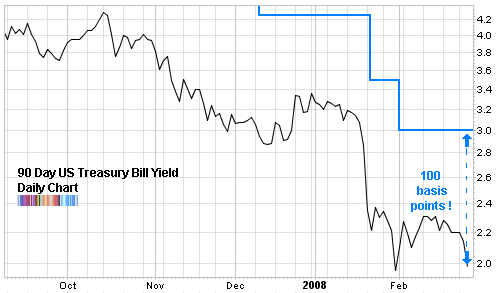 No argument on your analysis the intended fed funds rate versus the 3 month T-bill. I saw your article on Seeking Alpha and was curious about the 50 year chart. Is that the actual intended (target) rate or the effective rate? From what I can tell, the target rate is only published back through 1990. Happy to be corrected. Thanks. Cutest dog picture on a stock blog EVAR! At first glance, this reminds of John Hussman’s (compelling) argument that the Fed is irrelevant.